How many shelves come with the cabinet section? BEST ANSWER: The Alsace Modular Wine Racking Components cabinet comes with the cabinet and one tabletop. How wide are the actual shelves - as the frame is wider, and I’m guessing that the overall width listed is the frame width? BEST ANSWER: The Alsace Modular Wine Racking Components dimensions are listed for the unit as a whole. 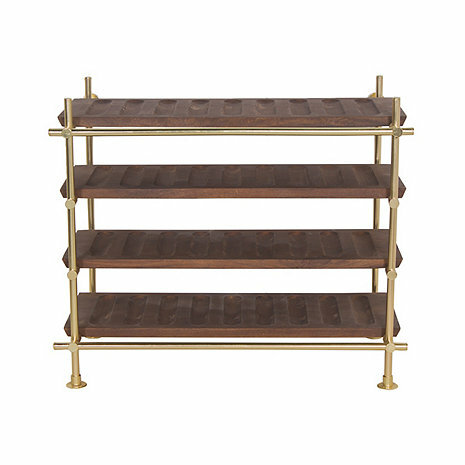 The shelves dimensions are as follows - 33 inches wide by 13 inches long by 1 inch deep. Can you stack more than one row of bottles on a shelf? BEST ANSWER: The Alsace Modular Wine Racking Shelving Components are designed specifically to hold one row of bottles on a shelf as there are inserts to sit your wine bottles in. However, there is enough room between the shelves to stack additional bottles on top of the others. BEST ANSWER: The Alsace Modular Wine Racking Components is comprised of mango wood, which is a densely grained hardwood with a strong structure. Are the shelves reversible to a flat surface?